I am a member of a yahoo email group, ESAD (Extra Special Aussie Demonstrators) which is for Australian and New Zealand Stampin’ Up! demonstrators to share ideas, ask questions, run swaps, share tutorials, participate in challenges and generally chat and get excited about Stampin’ Up! If you are an Australian or New Zealand SU! demonstrator, you can join the group by going to the group (ESAD). Here are a couple of cards that I have made with the Whimiscal Words set. I just love the words used in this set!! I’ve stamped the words onto Whisper White cardstock and then punched it out with the new 1 3/4″ circle punch and then created a Tempting Turquoise circle with the Circle Scissor Plus. I’ve layered it all together with whisper white 1/4″ grosgrain ribbon and done a bow to end it all off. I am having a blitz on the pink flamingo designer series paper at the moment. It was included in the recent clearance sale and I’ve been using it a lot!! I then layered with summer sun cardstock and the pink flamingo dsp. I stamped onto whisper white using cameo coral ink and then punched it out using the 1 3/4″ circle punch. Couple of dimensions on the back and you’re set to go!!! 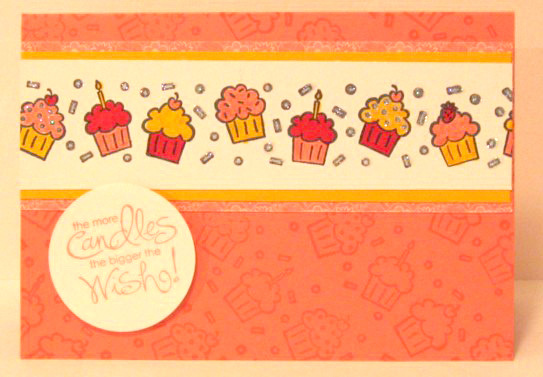 I love this stamp set from the Sale-A-Bration catalogue and it’s even better when it’s free!!! If you would like to earn this set for free, there are two ways you can do so. Place an order for $100 or host a workshop and achieve over $600 in sales. If you are interested in becoming a Stampin’ Up! demonstrator, Sale-A-Bration is a great time to join as you will receive an extra stamp set of your choice to the value of $79.95 with your starter kit. Email me at stampinwithrebecca@yahoo.com.au or phone 0408 193 792 today to get in early!! The next blog to visit is by Ros Davidson.